This beautifully packaged devotional is unique, written in the form of a letter from the reader to Jesus. Each devotion focuses on topics such as needing to slow down, stress less, rely on His strength, make wise decisions, further His kingdom, as well as praise and thank Jesus. 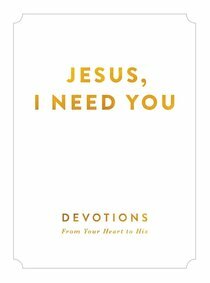 Arranged topically, each entry features a letter to Jesus that reminds the reader that we are not alone with our triumphs or tragedies, and that Jesus walks every step of every day with us. Every devotion has a Bible verse to reflect on as well as a takeaway message for the day, to provide comfort, encouragement, and strength for the reader. At the end of each devotion, there is space for the reader to record their thoughts, prayers, or even write their own letter to Jesus. This book puts life in perspective each day in a personal and intimate way. About "Jesus, I Need You"